Designed specifically to protect your assets from hackers and thieves, KeepKey is a hardware wallet that aims to secure digital currencies like: bitcoin, ethereum, litecoin, dogecoin, dash and namecoin. One of the most important features it has is a 100% open source firmware and also, anyone can buy the product very easy directly from Amazon. KeepKey is widely regarded as one of the most reliable hardware devices in the market. Keepkey.com has a single product at their clients’ disposal. The specs of the device are quite good. The product has an anodized aluminum case and a polycarbonate front. The technical information is as follows: USB HID, micro-USB connector, an ARM Cortex –M3, TRNG which is a hardware-based random number generator) and the screen is an OLED with 256×64 resolution and a diagonal of 3.12 inches. The product could be purchased from keepkey’s shopify store at a price of 129 US dollars per piece. The product is also available on amazon, for 136 pounds per piece. For this price you will get a device that works with the bitcoin wallet software on your computer by taking over the management of private key generation, private key storage and transaction signing. The hardware device does not have an OS so it cannot be inflected by malwares, key loggers or viruses. 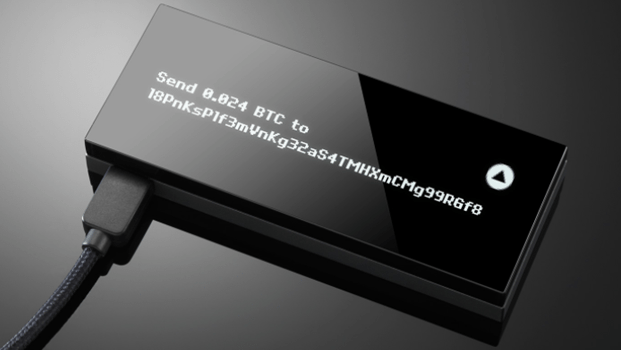 KeepKey is a hardware solution that can be used to generate bitcoin private key using its hardware-based random number generator. Combined with the randomness provided by your computer, you will be able to make digital currency transactions safely. It is also compatible with android or iOS devices, so you can manage your wallet directly from your mobile phone or tablet. Based on the reviews we’ve found on their website and amazon.com, KeepKey is a hardware wallet that can truly help you to secure your digital currency transactions. Although the price is relatively, we believe it’s worth the money, since it comes with security features and an OLED display, which is also very expensive to purchase. Summary: Designed specifically to protect your assets from hackers and thieves, KeepKey is a hardware wallet that aims to secure digital currencies like: bitcoin, ethereum, litecoin, dogecoin, dash and namecoin. One of the most important features it has is a 100% open source firmware and also, anyone can buy the product very easy directly from Amazon. KeepKey is widely regarded as one of the most reliable hardware devices in the market.